Mayor Bill De Blasio spoke at the Police Athletic Union today after the police shootings on Saturday. 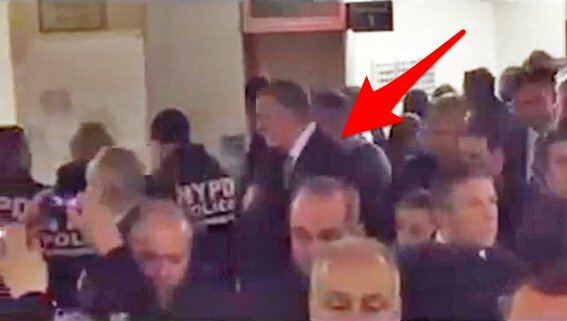 Police officers turned their backs on Mayor De Blasio in the hospital after the shootings on Saturday night. During his speech today at the Police Athletic League not once did the audience stop him with applause as the mayor tried desperately reach out to them… But De Blasio refused to apologize for his anti-police rhetoric. De Blasio said it was an opportunity to take stock in this moment. Our first obligation is to respect these families. I call upon everyone to stand by these families… We have to find that goodness. Everyone knows we should step back and focus on these families. NYPD Commissioner Bill Bratton received a standing ovation at the same luncheon. This was after the commissioner said De Blasio had lost the trust of the police.